Hahn & Clay offers one of the largest machine shops in the Gulf Coast area, with over 100 years of experience in manufacturing quality parts and repair work for a variety of industries including construction, forging manufactures, forest, mining, marine, oilfield, petro-chemical, refinery, tool and die and much more. 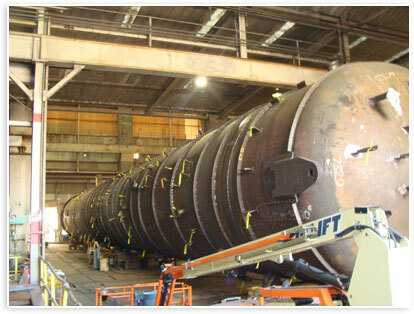 8 - Vertical Boring Mills; with our largest capacity being 35' x 6" diameter swing x 20' rail height. Maximum weight capacity 200 ton. 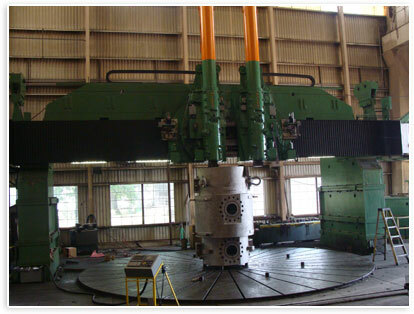 7 - Horizontal Boring Mills; with our largest capacity being 20' x 40'. Maximum weight capacity 160 ton. 8 - Lathes; with our largest capacity being 50'center to center maximum, 102" diameter swing. Maximum weight capacity 150 ton. We produce superior quality parts to customer specifications in short lead time by using skilled workforce and our production area that is 220,000 square feet under roof with machinery capabilities to handle up to 35'-6" diameter, 125' length, 200 ton Maximum weight and 30' under crane/hook height.